One quote sums up the attitude that Ben Cohen and Jerry Greenfield had when they first started selling ice cream in Burlington, Vermont: "If we were going to have a business we were going to have one that was consistent with our values.” That commitment to aligning business with values has never wavered and is reflected in the Ben and Jerry's mission statement, which integrates environmental responsibility, community participation, and social change into the business of making and selling ice cream. Get inspired by the philosophies and uplifting ideas for leading a successful business and living a successful life that Ben Cohen and Jerry Greenfield have contributed to the business community in general and the retail industry specifically. These Ben and Jerry quotable quotes are an inspiration for any retail or business leader who feels compelled to accomplish more with their business than selling things to make a profit. "We're all here in this world for some reason or another." "If you're aware of injustice, you can either ignore it, say there is nothing you can do about it, complain about it and not do anything, or put your energies into doing something about it. And for me, the only thing that is a meaningful use of my life is to work to improve the quality of life for people who are disadvantaged." "I don't believe that just because one person is born on one side of some imaginary line and another person is born on the other side means that a lot of people should be getting screwed through no fault of their own." "Business has never had improving the quality of life of the general public as one of its priorities. 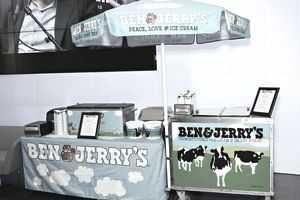 We decided to redefine the bottom line at Ben & Jerry's." “Governments need to measure strength, not in terms of how many people they can kill, but how many people they can feed, clothe, house and care for." "We thought, why don’t we get together and do something fun and be our own bosses and since we liked to eat we should do something with food." "Business can be a source of progressive change." "If you open up the mind, the opportunity to address both profits and social conditions are limitless. It's a process of innovation." "If you support the community, they will support you." "Now, when we face a problem like global warming, and you understand that the biggest impacts on global warming come from business and industry, I think business needs to take a leading role." "When you are led by values, it doesn't cost your business, it helps your business." "We measured our success not just by how much money we made, but by how much we contributed to the community. It was a two-part bottom line." “There are a lot of people who are going into business who are frustrated. The prevailing wisdom is that you can't have a successful business and use it to help society as well. [People think] If you try to have a business that tries to give to the people, it takes away from your ability to be successful financially."